Textiles require long, pliable string-like elements. The earliest current evidence for human awareness and manufacture of string comes (as impressions on clay) from Pavlov, a Palaeolithic site of about 25,000 B.C.E. in the Czech Republic. 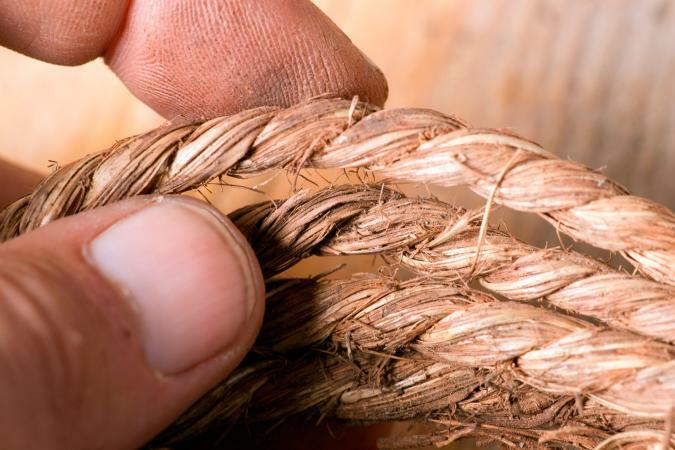 Thin, breakable filaments of plant-bast fiber were twisted into longer, stronger threads yarns that were then twined as weft (crosswise yarns) around the warp (lengthwise yarns) and around each other to make net-like fabrics. 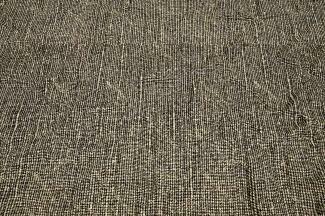 These fabrics are sophisticated enough that this cannot be the very beginning of either thread-, yarn-, or net-making. Other slightly later finds, plus the fact that all human cultures know the art of making string, confirm that this technology began in the Palaeolithic and spread everywhere with the human race. Indeed, string-making probably made it possible for humans to spread into difficult eco-niches, since it improves hunting/fishing capabilities and enables food-packaging. Interestingly, a few of the so-called Venus figures (hand-sized carvings of women, usually plump, dating to about 20,000 B.C.E. and found from France to Russia) wear garments clearly fashioned of string: string skirts, bandeaux, or netted caps. These garments seem to signal information about marital status. The first proof of true weaving occurs circa 7000 B.C.E. at the start of the Neolithic, with impressions of plain-weave and basket-weave on clay at Jarmo (north-east Iraq) and a pseudomorph (minerals having outward characteristics of organic materials) of a plain-weave textile on a bone at Çayönü Tepesi (southern Turkey). Again, these fabrics are too well done to be the start of weaving. Over the next millennium, fragments and impressions of mats, baskets, and twined textiles are found scattered through Iraq, western Iran, Turkey, and the Levant. Sizable pieces of linen actually survived in a desert cave at Nahal Hemar, Israel, circa 6500 B.C.E. ; one needle-netted piece adorned with stone buttons is apparently a ritual hat. Around 6000 B.C.E., at Çatal Hüyük in central Turkey, there was such a preponderance of plain-weave over twining, among the many fragments of linens used to wrap ancestral bones, that one can conclude the heddle (mounted loop) that forms a harness to separate warp yarns in a loom had been invented. (True-weave fabrics ravel easily, unlike twined ones, so the only advantage to true weave is that the process, unlike twining, can be mechanized with shed bars and heddles. So once the heddle-a conceptually difficult invention-is available, weaving ousts twining thanks to the speed of manufacture.) This corpus includes tied fringes, reinforced selvages (closed edges of a fabric that prevent unraveling), rolled and whipped hems, weft twining and warp-wrapped twining, as well as coarse, fine, tightly- and loosely-woven fabrics. With the heddle invented and domestic flax available, large-scale weaving began to spread in all directions. In Europe have been found remains of vertical warp-weighted looms in villages around the central Danube by 5500 B.C.E., a tradition reaching the Swiss pile-dwellings by 3000 B.C.E. as it spread west and north. By 5000 B.C.E. crude linen-weaving spread south to Egypt, where someone painted the first known depiction of a loom circa 4200 B.C.E. Weaving with heddles also spread eastward across Eurasia, apparently reaching Tibet and China circa 5000 B.C.E. Inhabitants of the western hemisphere probably invented twined fabrics on their own (unless, like string, this technology entered with them); the earliest finds date to about 8000 B.C.E. But true weave does not appear until nearly 2000 B.C.E., radiating from an area of northwest South America containing both archaeological and linguistic evidence that some Asiatic foreigners had somehow arrived. That suggests that the heddle was invented only once, in either the northwestern Near East or southeastern Europe, some time before 7000 B.C.E., and spread worldwide from there. Despite the subsistence-level economy of the Swiss pile-dwellers and their neighbors, central and western Europe is the one area where there is evidence of decorative patterning in Neolithic textiles: supplementary weft and occasionally warp patterns (both overshot and brocaded), beading (with seeds), an example of the Log Cabin (color-and-weave) pattern, and what may be embroidery (the originals were lost in one of the wars-only drawings survived). All these textiles were too blackened to show color, but the investigator of the most ornate claimed that it would not have been made that way unless the weaver were juggling at least three colors. A Neolithic site in France produced evidence of dyeing thread yarn with both kermes (red) and woad (blue), both colorfast dyes. Other evidence for patterning comes from clay figurines of women found in the Balkans and Ukraine: Many are naked and some wear string skirts, but others wear simple wraparound skirts with a square or checked pattern. Up to 4000 B.C.E., the only readily available fibers came from plant stems (bast fibers: flax around the Mediterranean; hemp farther north across Eurasia, including China; yucca, maguey, among others in the western hemisphere). Sheep (Ovis orientalis) had been domesticated in the Near East around 8000 B.C.E., but for meat-their coats consisted primarily of bristly kemp, with only a short undercoat of ultra-fine wool (5 microns) for insulation. "Nice" modern wool runs 15 to 30 microns in diameter, but the wild kemp runs about 300 microns and has no torsional strength, so it cannot be twisted into yarn. It appears to have taken 4000 years of inbreeding to develop sheep with usable amounts of wool in their coats (genetic changes gradually eliminated the kemp, while the wool grew longer and heavier). Once woolly sheep were available, however, everyone wanted them and soon they were taken to Europe and the Eurasian grasslands. Unlike bast, moreover, the wool of even a single sheep typically includes several shades of color, which can be sorted for patterning one's cloth. This helped fuel the explosion of textile technology in the next era. It is only as people began experimenting with metals, shortly before 3000 B.C.E., that they seem to have begun using cloth widely, and in particular to differentiate themselves with clothing. Since metals had to be obtained through trade or distant mining expeditions, people began moving around much more, causing new concentrations of wealth and greatly increased movement of ideas. A tall stone vase from Uruk (the Mesopotamian city in which writing first appeared about this time) shows the key domesticates-grain and sheep-in the bottom registers, with lines of naked workers bringing in the harvest above them, while in the top register we see the fancily dressed elite presenting gifts of food to a fully clothed goddess or priestess. As in the Palaeolithic, clothing developed-as seen here-primarily to send social messages, becoming ever more elaborate in both the Near East and Europe. Neither textiles nor paintings survive well in the Near East, but cuneiform texts attest to the importance of textiles. We see this particularly in the dowry lists of young women, with their chests of clothing (and numerous hats), in the high prices fetched by some textiles, and also in some women's letters (about 1800 B.C.E.) concerning textile manufacture. In one group, two queens, good friends, discuss their woes in overseeing the palace manufacture (by slave women) of fancy cloth and clothing that their husbands expect to use as important diplomatic gifts. In another set, a group of merchant-class women in Assyria, who were in business for themselves making and selling textiles, discuss and argue with their far-faraway husbands (who sold the textiles abroad) about types of cloth to make, prompt payment, tax-dodging, opportunistic purchases, and problems with the caravan-drivers who transported the goods. Textile manufacture, in fact, was basically women's work in early times, as shown by the representations (which generally show women doing the spinning and weaving) and the location of textile tools in women's graves, not men's. Men, however, often helped with fiber production, felting or fulling, dyeing, and final sale (although much cloth was made for the family itself). In Egypt, however, many matters differed. Traditionally women spun thread and wove it into cloth, but men also spun, making the string and rope needed in the fields; and mat-weaving was men's work. In the murals, we see children learning to spin beside their mothers in the textile workshops. Men also did the laundry, which had to be done in the Nile where crocodile attacks were a problem. Archaeologists have found linens of all grades, from coarse sailcloth to pieces as fine as silk handkerchiefs (200 threads per inch). Unlike their northern neighbors, the Egyptians wore mostly only white linen, since they preferred to have clean, bleached clothes every day (Egypt is very dusty and linen is wonderfully wash-and-wear, unlike wool); for color they used beads and other jewelry, instead of patterned cloth. Since textiles are preserved far better in Egypt than most other places, people tend to think everyone "back then" wore only white cloth, which is not true. The glory of Bronze Age weaving designs is most visible in the frescoes of Minoan Crete, where we see women in particular arrayed in sophisticated polychrome patterns, especially running spirals, three- and four- petaled interlocks, and small all-over patterns closely reminiscent of twill and rosepath designs. The men wore simple loincloths with fancy woven edgings, but the women wore long flounced skirts and tight-fitting short-sleeved bodices and sashes sewn up from these elaborately patterned cloths. For a millennium (c. 2100-1200 B.C.E. ), Aegean weavers even exported large, brightly patterned cloths to the Egyptians, who apparently coveted them for making ostentatious canopies. For actual color, some Bronze Age textiles of Central Asia have preserved stunning reds, blues, and yellows. As the Bronze Age progressed, the Mesopotamians, Minoans, and Egyptians all began importing ornate textiles from Syria, which seems from its texts to have been an important center of the industry. (Textiles themselves do not survive there.) Around 1475 B.C.E., Egypt even imported both tapestry technique and the "tapestry loom" (vertical two-beam loom) from Syria, where both seem to have begun a millennium earlier. By 1200 B.C.E., Egyptians depict Syrian and Aegean captives as wearing extremely ornate clothing characterized by friezes of animals. This tradition of friezed textiles seems to have survived in Greece through the period of destructive attacks that ended the Bronze Age around 1200 B.C.E., resurfacing there about 800 B.C.E., where, in being copied onto Iron Age Geometric and Wild Goat styles of pottery, it jump-started Greek art. In India, cotton was domesticated before 3000 B.C.E., but it reached the Mediterranean only after 1000 B.C.E. Cotton is easy to dye, and the Bronze Age city-dwellers of the Indus valley apparently exploited this trait, judging by the dye-installations and occasional depictions. In northern China, people discovered silk by 2000 B.C.E., developing its production, dyeing, and weaving into a high art-and a royal monopoly-during the great Shang dynasty (1500-1100 B.C.E.). Unfortunately, little but pseudomorphs has survived from periods before the mid-first millennium B.C.E. True weaving was well developed in the Andes and in Central America before Europeans arrived. The Andean people had available not only cotton (native to both New and Old Worlds) but also the wool from alpacas, which occurs in a wide variety of shades from white through soft browns to black. Many superbly crafted pieces of tapestry and embroidery have survived, thanks to the cold, dry climate of the high Andes. Mayan and Aztec textiles have seldom survived, although we know from accounts and images that they were sometimes quite ornate. North of the "four-corners" area of the western United States, the heddle was still unknown. 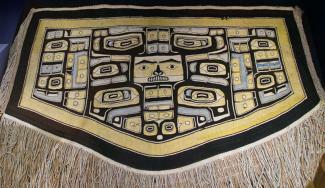 The one famous type of ornamented cloth from prehistoric North America, the Chilkat blanket, was laboriously twined onto a hanging but unweighted warp. (The Navajo did not start to weave their colorful blankets until the late nineteenth century.) The feathered garments of the Hawaiian royalty, too, were made by twining, using the twist of the plant-fiber weft to bind in the brightly colored feathers. See also Natural Dyes; Linen; Loom; Wool. Bast Fiber: Fiber that is obtained from the stem of a plant. Examples include linen from the flax plant, ramie, and hemp. Heddle: Device on a loom through which each lengthwise yarn (warp yarn) is threaded that allows warps to be raised and lowered during weaving. Kemp: Straight, short, stiff, silvery white fibers in wool fleece that do not spin or dye well. Kermes: Natural red dye used since ancient times that is made from the eggs obtained by crushing the bodies of a tiny female insect parasite found on oak trees. Overshot:A type of weaving in which an additional set of crosswise yarns extend across two or more lengthwise yarns in a plain background weave to form a pattern or design. Pile fabric surface on which fibers, yarns, or raised loops that may be cut or uncut or stand up on the surface of a background fabric. Pseudomorph: When used in reference to textile evidence found in archeological sites, a mineralized imprint of textile yarns or fabrics. Selvage:The lengthwise edge of a woven fabric that is often made with heavier yarns and woven more tightly than the rest of the fabric in order to make this area strong and secure. Shed Bar: Rod or stick on a primitive loom that is used to separate one set of lengthwise (warp) yarns from another set so a space (called the shed) is made that allows the passage of the crosswise (weft) yarns. Supplementary Weft: An extra crosswise yarn, in addition to the primary crosswise yarn. Warp/Warp Yarn:Lengthwise yarns in a woven fabric. Weft/Weft Yarn: Crosswise yarns in a woven fabric. Woad: Natural blue dye obtained by fermenting the leaves of the woad plant, Isatis Tinctoria. Adovasio, J. M., Olga Soffer, and B. Klima. "Palaeolithic Fiber Technology: Data from Pavlov I, ca. 26,000 B.P." Antiquity 70 (1996): 526-534. Earliest preserved textile remains yet found. Barber, Elizabeth Wayland. Prehistoric Textiles. Princeton: Princeton University Press, 1991. Compendium of archaeological textile data from 20,000 B.C.E. to about 400 B.C.E., from Iran to Britain; technical history of early textiles. Massive index and bibliography. --. Women's Work: The First 20,000 Years. New York: W. W. Norton and Company, 1994. Social and economic history of early cloth and clothing. --. The Mummies of Ürümchi. New York: W. W. Norton and Company, 1999. Superbly preserved textile finds from prehistoric Central Asia. Burnham, Harold B. "çatal Hüyük: The Textiles and Twined Fabrics." Anatolian Studies 15 (1965): 169-174. Preserved textiles from 6000 B.C.E. Cotte, J., and Ch. Cotte. "Le Kermès dans l'antiquité." Revue archéologique 7 (1918): 92-112. Neolithic fiber-dyes. Dalley, Stephanie. "Old Babylonian Dowries." Iraq 42 (1980): 53-74. What women wore in Mesopotamia 4,000 years ago. --. Mari and Karana. London: Longman, 1984. Letters (often about textile work) of two Mesopotamian queens. Schick, Tamar. "Perishable Remains from the Nahal Hamar Cave." Journal of the Israel Prehistoric Society 19 (1986): 84-86 and 95-97. Preserved textiles from 6500 B.C.E. Schlabow, Karl. "Beitrage zur Erforschung der jungsteinzeitlichen und bronzezeitlichen Gewebetechnik." Jahresschrift für mitteldeutsche Vorgeschichte 43 (1959): 101-120. Patterned Neolithic textiles from Germany. Veenhof, Klaas R. Aspects of Old Assyrian Trade and Its Terminology. Leiden, Netherlands: E. J. Brill, 1972. Old Assyrian textile trade, including letters of women weavers. Vogt, Emil. Geflechte und Gewebe der Steinzeit. Basel: Verlag E. Birkhäuser, 1937. Full analysis of Neolithic Swiss lake-bed textiles, circa 3000 B.C.E. Welters, Linda, ed. Folk Dress in Europe and Anatolia: Beliefs about Protection and Fertility. Oxford and New York: Berg, 1999. Analysis of rural survivals of important (message-bearing) prehistoric designs in women's cloth and clothing.